An interagency, cross-disciplinary team of experts recently convened in Washington to provide Congressional staff with a briefing on atmospheric rivers, subseasonal-to-seasonal precipitation prediction needs, and the benefits of enhanced predictive forecasting technology to the future of water management. Attendees heard from a diverse panel of experts representing a broad spectrum of perspectives, including government engagement by the National Weather Service and the U.S. Army Corps of Engineers, scientific findings presented by the Scripps Institution of Oceanography, and regional impacts to stakeholders represented by the Western States Water Council. 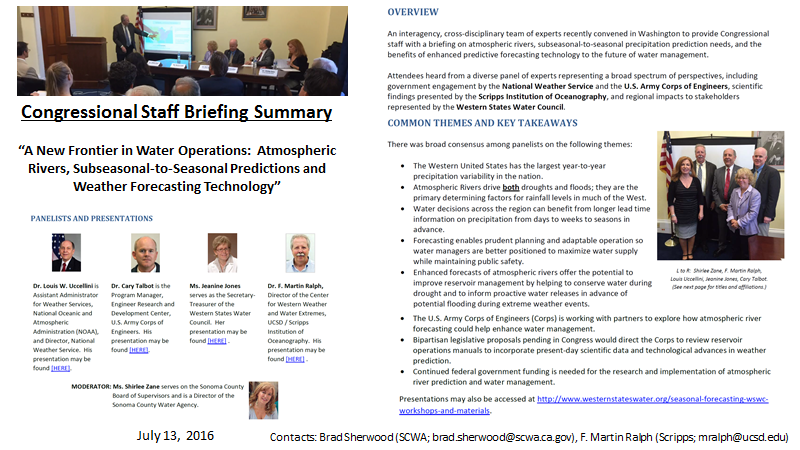 This briefing highlighted CW3E’s major effforts on atmospheric river science, monitoring and predictions, and their application to possible new water management strategies, such as Forecast-Informed Reservoir Operations (FIRO; http://cw3e.ucsd.edu/FIRO/), which is co-led by CW3E’s Director, F. Martin Ralph. Roughly 40 people attended, including representatives of congressional offices, committees, ACWA, federal agencies and other groups.